Any social application you encounter nowadays features a timeline, showing statuses of your friends or followers generally in a descending order of time. Implementing such a feature has never been easy with common SQL or NoSQL databases. Complexity of queries, performance impacts increasing with the number of friends/followers and difficulties to evolve your social model are points that graph databases are eliminating. The application is built on Silex and has users following other users. The goal throughout this article will be to model the feature of feeds efficiently in order to retrieve the last two posts of the people you follow and order them by time. You’ll discover a particular modeling technique called Linked list and some advanced queries with Cypher. The source code for this article can be found in its own Github repository. People who are used to other database modeling techniques tend to relate each post to the user. A post would have a timestamp property and the order of the posts will be done against this property. 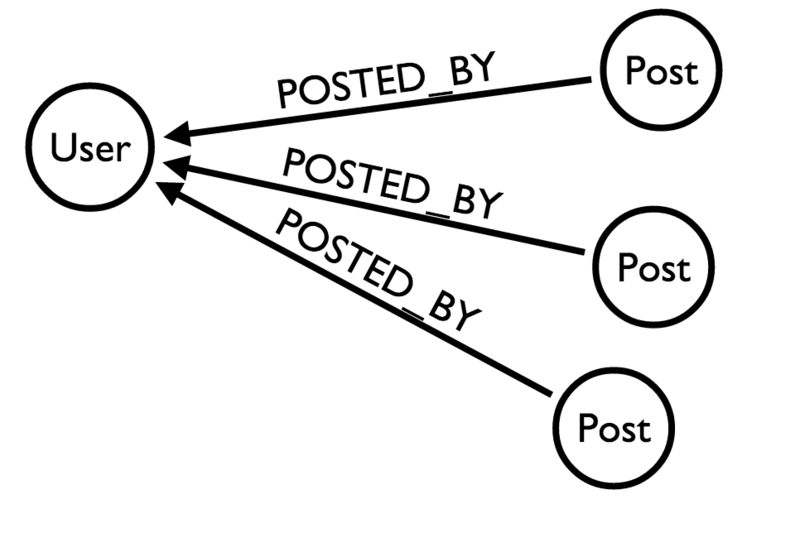 A node in a graph database holds a reference to the connections he has, providing fast performance for graph traversals. With this model, you have immediate access to the latest post of a user. In fact, you don’t even need to have a timestamp at all to retrieve its timeline (we will keep it though, in order to sort the posts across different users). More importantly, what the user is doing in time is modeled in a natural way in a graph database. Being able to store the data in a manner that corresponds to how this data is living outside the database is a real benefit for analysis, lookups and understanding your data. As in the previous articles, we’re going to load the database with a generated dummy dataset with the help of Graphgen. You’ll need to have a running database (local or remote), go to this link, click on Generate and then on “Populate your database”. This will import 50 users with a login, first name and last name. Each user will have two blog posts, one with a LAST_POST relationship to the user and one with a PREVIOUS_POST relationship to the other feed. The application already has a set of controllers and templates. You can pick one user by clicking on them and it will display their followers and some suggestions of people to follow. We will map the route to an action in the src/Controller/WebController.php file. In this action, we will fetch the feeds of the given user from the Neo4j database and pass them to the template along with the user node. We first MATCH a user by his login name. We then MATCH the last feed of the user and expand to the PREVIOUS_FEED (The use of the *0..2 relationship depth will have effect to embed the latest_post node inside the post nodes collection) and we limit the maximum depth to 2. We return the found feeds in a collection. If you now choose a user and click on the show user posts link, you can see that our posts are well displayed and ordered by descending time without specifying a date property. If you’ve imported the sample dataset with Graphgen, each of your users will follow approximately 40 other users. To display a user timeline, you need to fetch all the users he follows and expand the query to the LAST_POST relationship from each user. When you get all these posts, you need to filter them by time to order them between users. The process is the same as the previous one – we add the route to the index.php, we create our controller action, we add a link to the timeline in the user profile template and we create our user timeline template. First we match our user. Then we match the path between this user, the other users he is following and their last feed (see here how Cypher is really expressive about what you want to retrieve). We order the feeds by their timestamp. 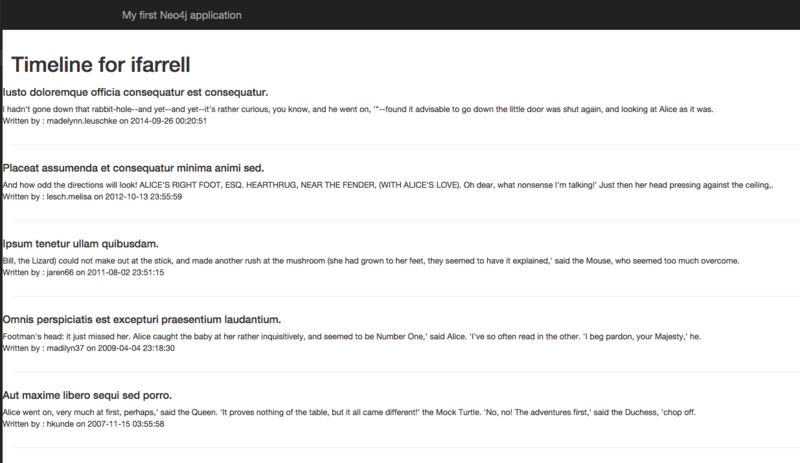 We return the feeds in collections containing the author and the feed. We limit the result to 20 feeds. We now have a pretty cool timeline showing the last 20 feeds of the people you follow that is efficient for the database. In order to add posts to linked lists, the Cypher query is a bit more tricky. You need to create the post node, remove the LAST_POST relationship from the user to the old latest_post, create the new relationship between the very last post node and the user and finally create the PREVIOUS_POST relationship between the new and old last post nodes. We first MATCH the user, then we optionally match his LAST_POST node. We delete the relationship between the user and his most recent last post. We create our new post (which in fact is his last post in his real life timeline). We create the relationship between the user and his “new” last post. We break the query and pass the user, the last post and a collection of his old latest_posts. We then iterate over the collection and create a PREVIOUS_POST relationship between the new last post and the next one. The tricky part here, is that the oldLatestPosts collection will always contain 0 or 1 elements, which is ideal for our query. In this article, we discovered a modeling technique called Linked list, learned how to implement this in a social application and how to retrieve nodes and relationships in an efficient way. We also learned some new Cypher clauses like SKIP and LIMIT, useful for pagination. While real world timelines are quite a bit more complex than what we’ve seen here, I hope it’s obvious how graph databases like Neo4j really are the best choice for this type of application. Nice Article. I love it when (relatively) new technologies are demonstrated with PHP, like this article demonstrates. I'd just like to throw in this link to the Cypher library. https://github.com/endyjasmi/neo4j Maybe it might help someone find it quicker. I Googled for "Cypher PHP" and ended up on the Neo4J web site, but the link there to Github was broken. 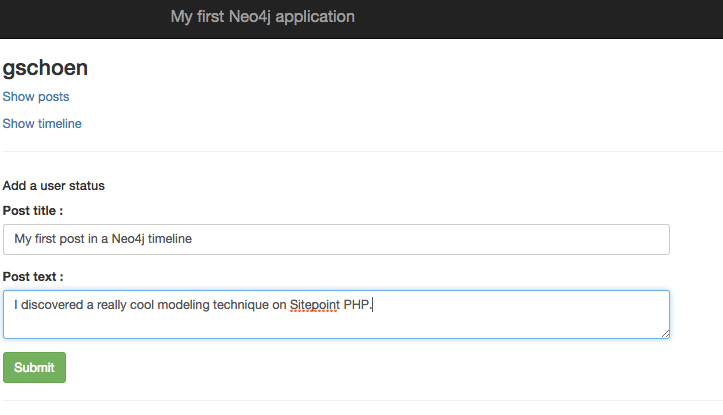 I'd love to see more on how to work with PHP and Neo4J. Does anyone else have any experience with Neo4J or with a REST API to a database? Is it performant? I would imagine it isn't as fast as a native driver, or is it? I was aware of the library you mentioned, however by using extensively Neo4j in production at several customers I had never the need to implement this kind of Cypher wrapper. The Rest API is really powerful, you can manage transactions like you would do with any native driver and it implements streaming. The main concern right now is that the API Response is really verbose so if you fetch 1000 nodes you have a really big json back while generally you will implement lazy loading at this stage. There is some work on Neo4j internals for a new api protocol (SBE) which is far lot faster than JSON while JSON will still be supported. Um, I was confused. You had shown code with a "sendCypherQuery" object and I went searching. The endyjasmi Cypher repo is the repo that Neo4J links to for a PHP driver on their website, just that their link is broken. It was the first Google result. At first glance, I thought it was the preferred driver, but now I see, that could be a misinterpretation of the page on my part. I also found this one. Is that the better "client" driver? Or which driver would you recommend? 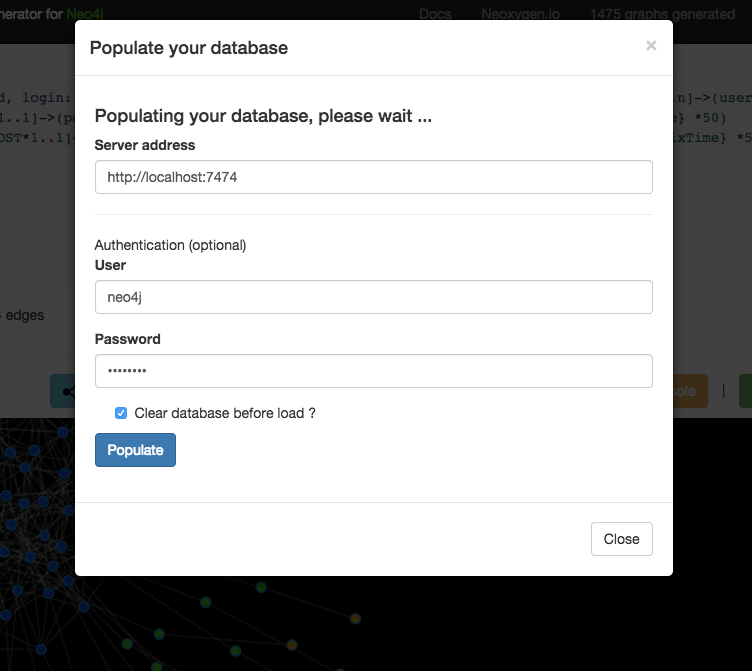 The one you mentioned here : neoxygen/neo4j-neoclient is the one used in this tutorial. It is the most powerful, extensible and production-ready driver. I'm maintaining this driver and as I'm working in tight collaboration with the Neo4j team it has the last updates almost immediately. * A really powerful graph response formatter that remap the portion of the graph you fetch in php nodes, relationships and paths objects. SendCypherQuery is used a lot, in fact Cypher is the SQL of Neo4j. There is btw at this time no real graph oriented object mapper, but we are working on it.